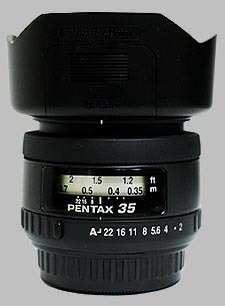 (From Pentax lens literature) The Pentax SMC P-FA 35mm f/2 AL wide-angle lens weighs a mere 6.9 ounces. Despite its compact size, it incorporates a high-quality aspherical lens element to effectively compensate for spherical aberrations and is treated with Pentax's acclaimed SMC coating to maximize light transmission and produce sharp, high-contrast images. I have had this lens for a few months now and its on my camera most of the time, so time for a review. Its a great lens and is particularly useful on a crop DSLR (field of view on crop is close to 50mm full frame). Look forward to trying it on my ME Super too. Definitely had to spend some time fine tuning the auto focus (on the K-5) because it was out quite a bit. Once I dialed it in though it is returningg very sharp photos. Its pretty sharp in the centre of the frame at f2 (a bit soft in the corners) and I find it very usable. Even better the contrast wide open is surprisingly good. Sweet spot seems to be f5.6 where it is very sharp across the frame. f4 is nearly as good as f5.6. I have noticed a little CA at times but its pretty minimal. The supplied hood is good and can be fitted in reverse over the lens body when not in used - protecting the lens. So far I am happy with bokeh and have not seen anything I would call ugly but then when I am looking for bokeh I shoot mostly wide open. The lens can focus relatively closely too - which helps. The more I use this lens, the more I'm liking it. I'm seeing a lot of good results even at f2. For example take a look at the second f2 image taken in bright contrasty light - there is a little CA (have not attempted to remove) on right side of the dragon head but otherwise its impressive with good contrast. I was initially a bit afraid ofthe focal length on digital, but this lens proved to be very useful companion for APS-C camera. I can rely on it's optical performance on any setting from f2 up to f22. Pictures are always well focused and sharp with no CA apparent and free of flare or ghosting. It is quite useful for close-up's as well, but there the hexagonal aperture may render unpleasant bokeh sometimes. In use it is very practical, you can reverse it for macro as it has the aperture ring and the lens shade is easy to use with lens cap or polarizer. I don't regret the money spent on this one. This is a good lens for travelling light. It is small, well built and I've not seen any flare, it has very low distortion and practically no CA. Wide open it is very usable, the corners are less sharp but the center is already very good at F2. From F4 the whole image is very sharp.